I feel like all I talk about is blazers lately. Maybe it's Fall or maybe it's just the first time in my professional life I've worked in a school that didn't get heated to 98 degrees the second a chill hit the air! I'm really enjoying being able to wear blazers comfortably all day long. I always wondered what it would be like to not be hot all the time and now I finally get to experience it. This little herringbone Jacket has been in my collection for a few years now, purchased at Banana Republic, which is a store I rarely find things that fit me well. It seriously feels like a sweatshirt but gives such a polished finish. Most of my Fall layers are a few years/seasons old because I bought them with the hopes of wearing them but never really could. Now they get so much use I actually had to go purchase more...not that I'm complaining. By the way, that $30 Camel Target blazer I talked about yesterday, I wore today while I was making a return at J Crew. I was shocked to see this blazer which was near $800 bucks! Now my Target jacket is NOT made of fine Italian cashmere, but for $770 less I got the cheap version that looked so similar to the J Crew one, that the woman working the register actually asked if it was from there! I'd call that a steal! 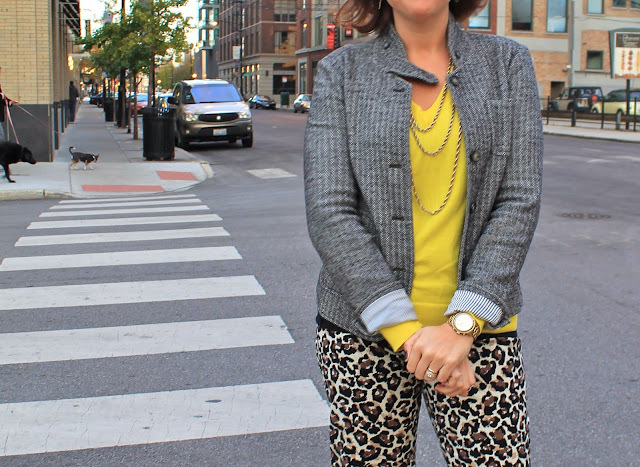 Jacket: Banana Republic, Yellow Sweater: J Crew Outlet, Leopard pants: Loft, Booties: Report Marks (buy here), Watch: Michael Kors, Necklace: Forever 21(also worn here and here with much redder hair), Earrings: Francesca's. Have a fabulous Fall weekend everyone and thanks for reading! looooove this outfit!! 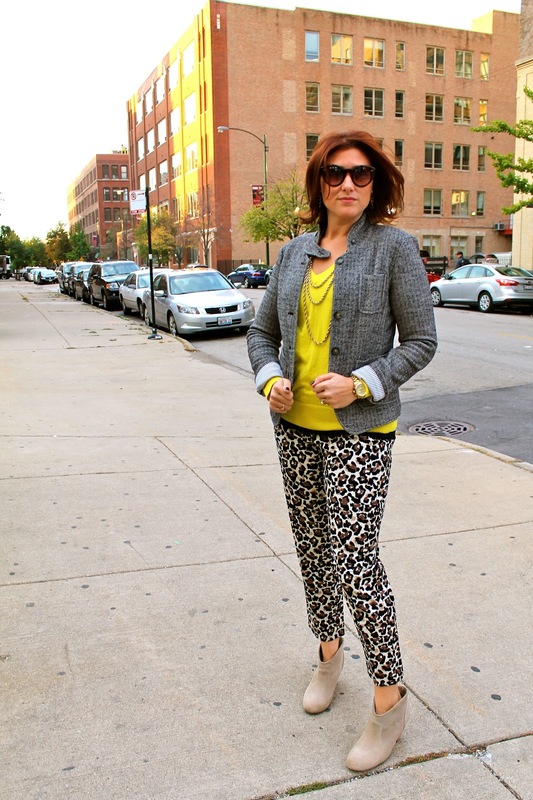 The gray, the leopard, the pop of color, the booties... It's genius. And it's definitely one of my favs!!! I bought those Loft pants but in a slightly different pattern recently, can't wait to wear them.